Designing the right marketing mix is most difficult and challenging step in marketing. Marketing mix includes choosing the product with right distribution channel while undertaking eye catching promotion, adopting right pricing tactics and strategies. 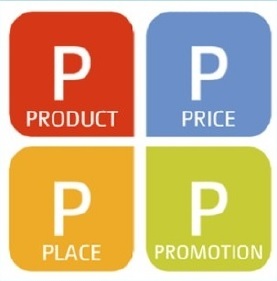 They are also know as 4P's of marketing mix. Marketing mix cover all of the key elements needed in marketing of the product or services. Lets know the four key elements of marketing mix. Product refers to functions, features and attribute of goods or services. Product also consist other elements such as quality, packaging and after sales service. Without the product there would be no need of price, place and promotion since it is considers as heart of the marketing mix. Four key elements of marketing mix. Price refer as how much a consumer is going to pay for the product or service. Price is another important element of marketing mix. Customer are more sensitive to price it can really make or break the product. It is very important to select right pricing tactics and strategies specially in competitive environment. Where can customer come to buy the product and how the product actually gets to the customer. Place is about distribution strategy of the company for its product. It also includes the logistic aspects of distribution such as warehousing, transportation, etc., needed for geographical allocation of products. Promotion refers as how the product is communicated to consumers. Many of us thing promotion is all about advertisement but promotion is not just about advertisement it also includes personal selling, public relations, direct marketing and sales promotion.